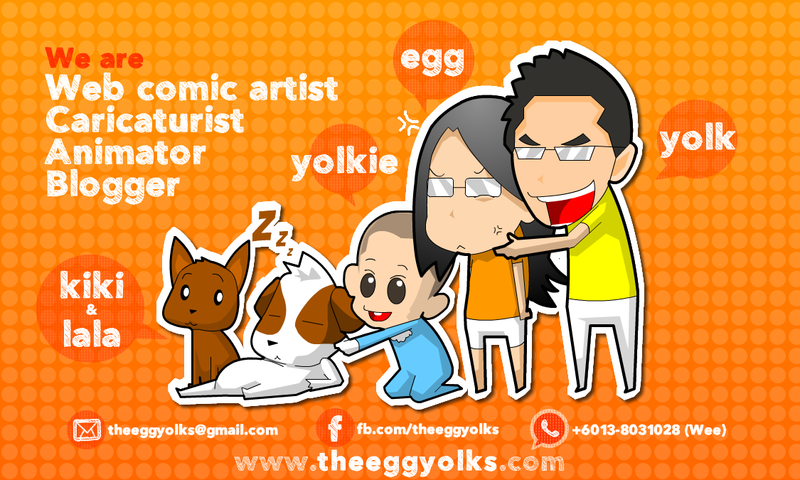 THEEGGYOLKS 蛋黃打点滴: And the award for “Best Video” goes to...Me! Me! Me! And the award for “Best Video” goes to...Me! Me! Me! Remember the Airasia Megastore Video I made few months ago? You can find it here. Well, it actually won the grand prize for Mega Shopping Experience Video Contest by Koolred and Airasia Megastore! They even interviewed me (it was my first time actually >_<). So here's the interview! Koolred (K): Hi Wee! Congrats once again for your winning video submission on Koolred. How does it feel being crowned the Grand Prize Winner? Wee (W): (laughs) I was overjoyed! To be honest, I was not expecting to be the Grand Prize Winner. K: So, what made you decide to participate in the video contest? W: I thought this was a good opportunity to practice my animating skills as it is my passion, and if I could be rewarded at the same time why not? I've always wanted to be a proud owner of the Olympus-PEN camera. K: Were you nervous prior to the results? Did you find any videos that you thought were really impressive? W: (laughs) I had my computer turned on the whole day on 11th of October (the result day). I even called my friends to check Koolred's page and to text me if the announcement was made. If I'm not working, I would sit in front of the computer and keep refreshing the Koolred's homepage! In fact, all the videos were awesome! However, the few that caught my attention was the 3D animation by Ivan Lee, "AirAsia Megastore! Shop Now!" and Cyril Dason's "They Deliver". I'm so glad that I won as the competition was really tight. K: It seems like you went through quite a lot to compile the end product. Do you think you can run through the production process with us? What was the most difficult and easiest part of the production? W: Unfortunately, there's no easy part in animation production. Seriously, I worked on the animation till 3 in the morning (with my good mate, coffee of course). I'm not sure how other people do their animations but I work based on my mood... or when inspiration kicks in. When the ideas rush in, I would refuse to stop until my body had reached its limits. With any original production, everything has to start from scratch where I would have my story boarding sketched in papers. Then I'll slowly redraw everything using Macromedia Flash (a programme which is used to produce flash animations). My friends have always asked what I use to draw my cartoons with. Well, the only tool I need is the "mouse"! Once the drawings are animated, I proceed to the narration part. I would also need to create the background music as it was stated in the contest's Terms and Conditions that all music in the entry must be composed by the creator himself. So what I did was the simple, trusted finger snapping technique. Then, I proceed to insert captions into my animation. This process is tricky as you need to make sure that all the captions appear according to the narrations. At last, the video is complete and ready to be uploaded on Koolred. It's a wrap, and I am finally allowed to sleep (laughs). K: Wow that's a whole lot of work! But the end result was incredible, nonetheless. So Wee, tell us in no less than 25 words, what is "Koolred" to you? W: Koolred, to me is a combination of a travel guide and many great social networking sites. It is the coolest community site that offers great travel information and guides, and is a terrific place to socialise with people around the globe. K: Complete the following sentence: "WOW! AirAsia Megastore has…"
W: WOW! AirAsia Megastore has... all the things you need at the lowest price. Now everyone can buy! K: Lastly, what do you plan to do with your brand spankin' new Olympus-PEN camera? Have you already started browsing the AirAsia Megastore site for what you intend to buy with your RM300 worth of e-Vouchers? W: School holidays are just around the corner and I have plans to go travelling to Penang or Kota Kinabalu in Malaysia, so my new camera from Olympus will help me capture the best pictures of all these places. Other than that, I can finally upload quality pictures in my blog! As for the airasiamegastore.com e-Vouchers, my girlfriend and I plan to use them to get a blender and mixer as we enjoy cooking and baking. The e-Vouchers really do come in handy! Thank you, Koolred!